Let's hear a warm welcome for the diminutive Bonwyn Bishop MP who arrives back on the Opposition front bench, elevated today by the Mad Monk Tony Abbott. As a sometime walker of the Antipodean Iron Lady-who makes her heroine Margaret Thatcher look like a lefty-underneath that steely exterior tSS can report is a real party gal. 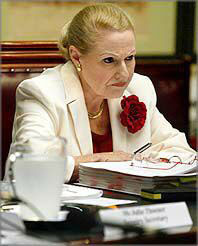 Bronny becomes Opposition spokesperson on aged care. She has experience here. In a similar role under PM John Howard she had to weather the storm that surrounded reports of pensioners being scolded in baths and doused in kerosene in Victorian retirement homes. With a tSS produced Warhol style portrait dominating her Dee Why electorate office, Bishop had made many a senior public servant wilt under her fixed gaze and rapid fire questioning in Senate Estimates Committees. Once, when Minister for Armed Forces Personnel, Bronwyn inspected one of the new Collin's Class submarines and later back on the wharf and surrounded by young smiling sailors announced to the assembled media flock: "I'm the first female politician to go down on a submarine !"